Dawn is a young girl with an untouched genotype of great vintage. She has been brought up by a Meta, a large group of adults who share the parenting function, who have a less ancient genotype but whom are still Originals – people with virtually no connection to external machine intelligences. As Dawn reaches towards adulthood (not altogher convincingly described by Benford) her experiences of work and love, both with higher-genotype humans, cause her to questions issues about humanity and herself. A dramatic onslaught, caused by sudden contact with higher/other dimensional intelligences, leaves her looking to the future whilst holding on to that which makes her an orginal human. Will this be a start of a new Dawn? The story has that compressed feel to it, and could have benefitted from a longer treatment (or a bit of judicious snipping of the text which makes it a slightly slow-paced story). The fact that in this far future the onset of menstruation, and the size of men’s genitalia are worthy of comment is somewhat bemusing. The story ends and could easily have ‘To be continued…’ added. A family visit a remote Scottish holiday home and find that there is something in the water that causes those who drink it to get violently aggressive. Well, to be fair, the story is well written, and the young child and her father, and ‘new’ mother, and their fledgling relationship as a new family is evocatively described, but storywise it’s fairly bog-standard horror. Tony Ballantyne. The Ugly Truth. A near/future-Earth setting, in which an academic on a flight to deliver a lecture is warned that she may be going to her death. The State does not want her shining the light of inquiry into the history of their species, and will kill if necessary. The academic ponders the warning, and the nature of that history, of how the humble potato in the hands of one perhaps from outside their race, who knew how such a humble thing can change history, and of their female forebear. Martha A. Hood. Give Them The Moon. A strange light seen on the Moon and the experiences of those who saw it (TV reality show contests on the lunar surface), and their varying perceptions of the event are described through statements and FAQ s.
A structurally clumsy story – an initial paragraph, then back 20 yrs, followed by jumps of several years to get back to the point when the story starts, and then a jump several years into the future. The basic premise isn’t a strong one – a female human settler on an alien planet finds that she cannot carry a child to full term. The settler’s medic realises that the indiginous intelligent life are sufficiently close in biological terms (duh!) to us to allow one to act as a surrogate. The child grows up, but towards the end Butler throws in a medical issue – in birth some of the birth mothers cells end up in the child, which is generally no problem as the dna is a close match. However, in ths case, the alien cells are finally being rejected by the human cells, but the alien cells have an amazing regenerative power (we have been told that they can, for example, re-grow lost limbs) and so the alien cells are taking over. And soon the human girl becomes and alien girl. SF of the type normally found in the likes of a Star Trek episode. Sadly in this case the medic can’t come up with a ‘serum’ to make things better. 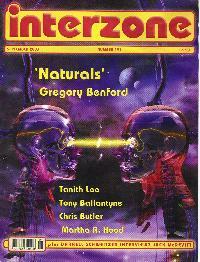 Interzone has been double-dating issues of late (ie July/August last month) in a bid to address slippage issues in their production schedule (ie they have been struggilng to get an issue out each month). I picked this issue up this September issue in mid-October, so they have a way to go yet, but, more worringly the big whole page ad on the inside front cover was for a convention in England on Oct 4th. I can’t imagine the con organisers would be particularly happying paying for ad that appeared after the event took place. The lack of an editorial/letters page this month, and the much-reduced reviews section. gives the issue a bit of an unloved feel, and the news, subsequent to my reading the issue, that Interzone is to reduce to a bi-monthly schedule is no surprise.